In job interviews everywhere you’ll almost inevitably run into the same handful of questions time and time again. One of the most popular is why you left your previous position. Answering this question can be tricky: you have to be able to give a logical explanation of why you left without coming off as bitter or negative. The difficulty of this question is compounded if you were fired or asked to resign from your last position. Fortunately, it doesn’t take an online PhD to come up with an effective response, and with a little forethought you can answer this question without hurting your chances of getting hired. To begin, it’s important to understand why employers ask this question at all. Applicants’ resumes may look terrific, but there may be a difference between what’s documented on paper and how people actually handles themselves on the job. By asking why you left your previous job, employers are looking to uncover potential problems with prospective hires that might not be reflected by their application materials. The interviewer is also trying to glean information about how you handle adversity. Whether you left your job voluntarily, were laid off, or were fired, your answer to this question will give a glimpse of how you act under trying circumstances. Asking this question is an investigation into your personal integrity. So, armed with this knowledge, how should you answer the question? It’s important to answer the question in a way that isn’t critical of your previous employer. Respond as positively as you reasonably can. If you left because you were burnt out with working for the company and decided you couldn’t stand to work there any longer, don’t trash your employer. Instead you might respond by saying you were seeking a position that would offer you greater opportunity to develop professionally. If you quit because you hated the job, you can talk about wanting a position with different responsibilities that your old company couldn’t provide. Whatever the case, don’t focus on the negatives about your previous employers. Instead, come up with a reason that casts your desire to switch jobs in a positive light. Another thing you can do to make yourself stand out is mention what you’ve been doing since leaving your job. If you’ve done consulting work or enrolled in classes, then by all means point it out. 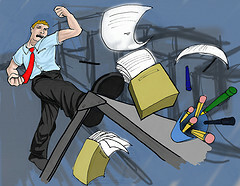 Employers tend to look favorably on activity between jobs that shows you can take initiative and handle adversity well. Finally, it’s important to make sure your delivery is accurate. Never tell an outright lie to an interviewer. A company can easily cross-check the reason you left your job with your previous employer. If a potential employer finds out you’ve misrepresented the circumstances of your last job, you’ll be in a worse predicament than if you had just told the truth, even if it isn’t totally favorable. Keep your response positive, but truthful as well. It may be necessary to practice your answer several times before the interview to ensure you can be honest without hurting your chances of being hired. This is a tough question, and leads many applicants to stumble if they’re unprepared. By being truthful and well-rehearsed in your response, you’ll be able to make a great impression on interviewers. A solid answer here will help push you to the top of the recruiter’s list, and put you that much closer to landing your next job. Good luck! This is a guest post from Elaine Hirsch. “Why did you leave your last job” is definitely one of the most challenging questions that jobseekers face. Since it is also one of the most commonly asked, applicants really need to avoid mistakes while responding. The article clarifies everything about why this question is asked so often and how it should be answered. Thanks for the wonderful tips! What do you say when you quit because the job literally made you sick and the atmosphere and conditions were so bad. You are 59 years old and had to file bankruptcy since your husband had bypass surgery and cost over 90 something thousand dollars and no insurance to pay it. How do you find a job after that. I have admin skills and in 2 1/2 years no response to jobs. Is it hopeless at this point. This is reality!!! you are one of the 99 percent. Terrible. So much riches in America, and so many unfortunate people. I hope things turn out for both of you. I don’t think there’s anything that could make me quit my job at the moment. Too much depending on my income!! This is one of the most commonly asked questions during an interview, and one of the trickiest as well. Thanks for sharing the tips on how to handle this tough interview question.